As I’d mentioned in my previous post, I am in the middle of revisiting and expanding on a chapter whose two central texts are Cabeza de Vaca’s Naufragios and Cooper’s The Last of the Mohicans. As part of that work, this morning I thought I would re-read the opening chapter of Carlos Fuentes’ 1987 novel Cristóbal Nonato (Christopher Unborn), since that section in particular is one of the other texts I take up in that chapter. In so doing, I realized that earlier remarks about another novel I’ll be discussing in that same chapter, along with commentary by Fuentes himself, will serve to reinforce some of my project’s larger claims about the Baroque and the New World, this time with a focus on literary aesthetics. All of that, I hope, will tie in (I hope not hog-tying style) with the politics of Martí and Mariátegui that I’ll also be adding to this chapter. Dalkey Archive edition of Three Trapped Tigers. 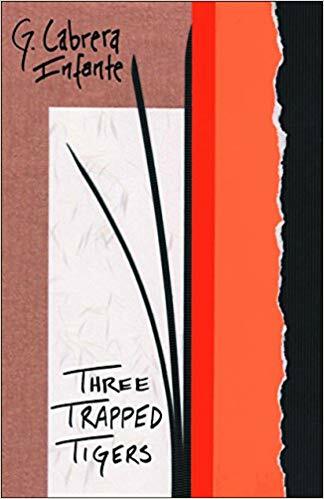 The other novel is by Cuban novelist Guillermo Cabrera Infante: Tres tristes tigres (1967; translated as Three Trapped Tigers). Its title (the first line of a Cuban tonge-twister) and its description by its English translators, David Gardner and Susan Jill Levine (with assistance from the author) of having been translated “from the Cuban” alert the reader that it is no ordinary novel. I’ve been engaged in some reading and rereading in anticipation of getting started on the third chapter of the book project, which will chiefly consist of readings of Cabeza de Vaca as he presents himself in Castaways and Cooper’s Natty Bumppo in The Last of the Mohicans and The Prairie. I have also been editing the preface, the Columbus chapter, and the Faulkner and Amado chapter with the goals of trying to tighten up the writing. Finally and most significantly, in the Columbus chapter I’ve incorporated an argument about the Baroque that you’ll see in this post. A while back, I wrote in this post about Foucault’s reticence as to the causes of the shifts in ideas about language and space that are his subjects in, respectively, The Order of Things and “Of Other Spaces.” For Foucault, the Baroque is the aesthetic of those shifts, but he seems deeply suspicious of it, if not actively dismissive of it: in it, “[s]imilitude is no longer the form of knowledge but rather the occasion of error, the danger to which one exposes oneself when one does not examine the obscure region of confusions” (The Order of Things, 51). Anyway, while in that earlier post I name the Encounter as the cause of those shifts Foucault describes, in the excerpt below I develop that more fully with an assist from Cuban novelist and theorist Severo Sarduy’s essay “Baroque Cosmology: Kepler” (found in Baroque New Worlds, one of the titles I mentioned here). I think this excerpt is pretty self-contained; just in case, though, “Carpentier” refers to Cuban writer Alejo Carpentier’s essay “Problemática de la actual novela latinoamericana, and “Benítez-Rojo” refers to Antonio Benítez-Rojo’s book The Repeating Island: The Caribbean and the Postmodern Perspective. I am hopeful that someone out there in the Interwebs who knows more than I do about Foucault and/or Sarduy will bump into this and leave a comment. Thanks in advance. Mappamonde, Gerard Mercator, 1587. Via. [The] dynamism inherent in this New World Baroque as described by Carpentier gives us some insight into his response to his argument that this hemisphere’s lack of a style conveys well the truths of this region. Moreover, other writers and critics likewise, in their own ways, either name the dilemma(s) New World writers encounter, or name it/them and then propose ways of framing New World experience similar to Carpentier’s own solution and his rationale for it. That solution lies not so much in postmodernism’s lack of a center and distrust of Grand Narratives but, rather, in the Baroque’s honoring of dynamism, its lack of fixedness, which creates a space within which the interactions of cultures and the land provide a common ground for this hemisphere’s writers.